Roots compete for and share resources with neighbouring roots, as well as with billions of microbes. Until now, however, little has been known about how plants coordinate construction of these complex subterranean assemblies. The new paper, “Redox-mediated Quorum Sensing in Plants,” published in PLOS ONE, is based on collaborative research by scientists at Florida Tech, Emory University and the University of Richmond. It answers some of the fundamental questions about how plants coordinate their growth and development in the soil. And because the same reactions at work in root growth are also used by plants to fight off infections, these findings could significantly improve our understanding of plant immunity and lead to substantial boosts in crop yields. 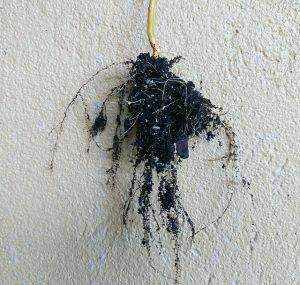 “It turns out that plants use chemistry to create a highly accurate map of the road ahead for a particular root — the same chemistry that people once employed to develop black-and-white photos,” said Andrew Palmer, an assistant professor of biological sciences at Florida Tech and leader of the university’s research team. Specifically, compounds known as quinones are found in both traditional photography and in the roots of plants. These compounds are crucial to the development of black and white photos because they increase the amount of silver particles deposited on photo paper creating a clear image through a process known as oxidation. And according to the new research, these quinones are generated when a young root grows close to a more mature one. The production of these compounds would then be amplified in a process similar to developing photographs, providing a ‘picture’ of the nearby root. Working with the model plant Arabidopsis thaliana, undergraduate researchers Alexandra Fuller and Phoebe Young at Emory, and Jamie Kitson-Finuff and Karl Schneider at Florida Tech confirmed the presence of a powerful oxidant at the growing tips of the roots. This oxidant reacts with materials on the surface of a mature root to produce the quinones. These compounds in turn stimulate more oxidant production, creating an enhanced signal – like a snapshot – focused right in front of the young root, alerting it to the mature root and the plant to which it belongs. Florida Tech graduate students Stephen Lazar and Purvi Jain showed that the hydroquinone-like compounds suppress elongation of the young roots, and thus may help newly-growing roots avoid obstacles or competition. Read the paper in PLOS ONE: Redox-mediated Quorum Sensing in Plants (Open Access).